The Sand Wash Basin Advocates Team or SWAT is holding a meeting to discuss needs of the Sand Wash Basin wild horse herd and how people can volunteer and help as an individual, or as a SWAT member. 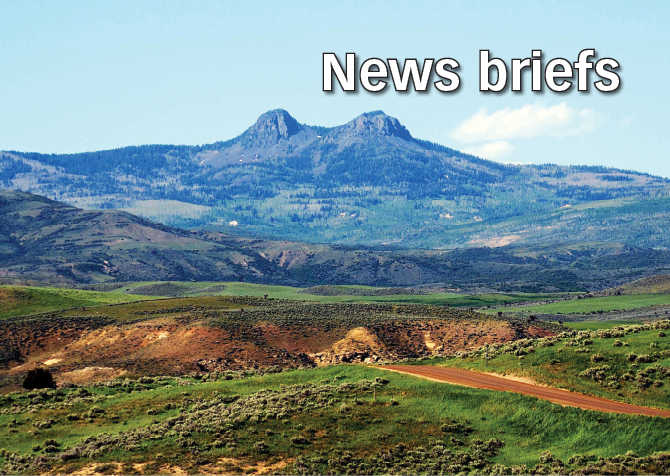 The meeting will include a presentation of current status and census of horses in the Basin, discussions on upcoming projects, events and the group’s working relationship with the Bureau of Land Management and areas of volunteer need. The meeting will conclude with an opportunity for the public to ask questions, provide suggestions and ideas. Refreshments will be provided. The meeting will be from 1 to 3 p.m. Saturday, Aug. 5 in room 201 of the CNCC Bell Tower Building, 50 College Drive. For more information contact SWAT by emailing info@sandwashadvocate.org. Both Crosho Lake and its’ adjacent Dispersed Campground in the Little Flat Tops Range, Routt National Forest, will be closed for dam repairs that began on Monday. Temporary closures are expected to be in effect at least eight weeks and could possibly last through the fall. Nearly a mile of nearby Forest roads are also affected by the area closure. The closures are necessary to repair the leaking valve and outlet pipe on the dam, which is located approximately seven miles west of Yampa, Colo. A closure order to accommodate repair work is on the books through Dec. 1, however, it is not anticipated that the work will take that long. In addition to the lake and dispersed campground, nearby Forest Roads 930.2b, 930.2c, and 930.2d are temporarily closed. The contractor will be lowering the water level in the reservoir in order to gain access to the pipe both on the reservoir side and dam side. Closure of the entire lake is due to low water levels and exposure of lake bed, which could result in resource damage and public safety issues. Heavy equipment will be staged and working in and around the dispersed campsites. Dispersed sites along Forest Road 930 toward the Allen Basin Reservoir Trailhead, which is adjacent to the Crosho Lake Closure Area. The Chapman Campground, which is a developed site and is located off of Forest Road 940. It is approximately 13 miles away from Crosho Lake via county and Forest roads. Dispersed sites along the Dunkley Pass Road, Rio Blanco County Road 8 (approximately 10 miles away via county and Forest roads). Please know before you go! It is the user’s responsibility to know where they are and what types of restrictions there may be when accessing public lands. For more information about Forest conditions and ongoing projects, contact the Yampa Ranger District at (970) 638-4516. You can also visit https://fs.usda.gov/mbr, or follow us on Twitter, @FS_MBRTB. Average retail gasoline prices in Colorado have risen 0.4 cents per gallon in the past week, averaging $2.32/g yesterday, according to GasBuddy’s daily survey of 2,158 gas outlets in Colorado. This compares with the national average that has increased 3.5 cents per gallon in the last week to $2.31/g, according to gasoline price website GasBuddy.com. Including the change in gas prices in Colorado during the past week, prices yesterday were 19.1 cents per gallon higher than the same day one year ago and are 3.3 cents per gallon higher than a month ago. The national average has increased 8.3 cents per gallon during the last month and stands 18.2 cents per gallon higher than this day one year ago. $2.13/g in 2016, $2.79/g in 2015, $3.60/g in 2014, $3.53/g in 2013 and $3.49/g in 2012. Colorado Parks and Wildlife offers free park entrance to active-duty military and veterans during the entire month of August as a result of House Bill 15-1045, signed into law May 27, 2015. “We are very appreciative of Colorado’s military community and encourage them to take advantage of this offer to get out and enjoy the recreational opportunities within state parks,” said CPW Director, Bob Broscheid. Archery, boating, rock climbing, hiking, geocaching and wildlife-viewing, along with well-equipped nature centers and picnic areas are just a few of the options available for service members to relax and recharge. Additional outdoor recreation opportunities can be found in the Parks Guide. CPW encourages eligible individuals to get their pass in advance at any CPW office or state park to avoid delays at the gate on a planned recreation day. Though park entrance fees are waived for veterans and active-duty personnel in the month of August, activities like fishing and camping will still require a valid license and permit.